It's now 67 days until kickoff of Catamount football against the Mars Hill University Lions in E.J. Whitmire Stadium on September 5th in Cullowhee. 2014 (Redshirt Freshman): Played in all 12 games along the offensive line with a pair of starts … Made his collegiate debut in the season-opener at USF (Aug. 30) with his first collegiate start coming against Wofford (Oct. 11) … Both starts came at offensive left tackle. Prior to Western Carolina: Played both offensive and defensive line at Randleman High for head coach Shane Handy ... Played at right tackle on the offensive line ... Recorded 30 tackles including 20 solo stops as a senior ... Credited with four quarterback hurries ... Tabbed as "perhaps the best lineman in (Randolph) County" by MyRandolphSports.com, earning All-County plaudits as a senior. Personal: Has a younger brother, Bradley. It's now 68 days until kickoff of Catamount football against the Mars Hill University Lions in E.J. Whitmire Stadium on September 5th in Cullowhee. 2014 (Sophomore): Saw action in nine of WCU’s 12 games with three starts along the offensive line … One start came mid-season before starting the final two games at right guard. 2013 (Freshman): Played in 11 of the team's 12 games on the season, making six starts along the offensive line ... Made his WCU debut at ACC-foe, Virginia Tech, with his first collegiate start coming at Samford in league play ... Six starts all came in succession at midseason, each at left guard. Prior to Western Carolina: Is the first four-year player in Ronald Regan High history to sign with a NCAA Division I program ... Named All-Central Piedmont Conference at guard along the offensive line, keying Ronald Regan High to an 8-4 season and the school's first-ever playoff berth ... Garnered All-Northwest accolades from the Winston-Salem Journal ... Selected to the North Carolina roster in the 2012 Shrine Bowl, playing every snap at center ... Was named the offensive line MVP as a junior at the National Underclassmen combine held in Greensboro ... Listed as a two-star prospect by Rivals.com. Personal: Full name is Tanner Edward Poindexter ... Is the son of Clay and Vicky Poindexter. It's now 69 days until kickoff of Catamount football against the Mars Hill University Lions in E.J. 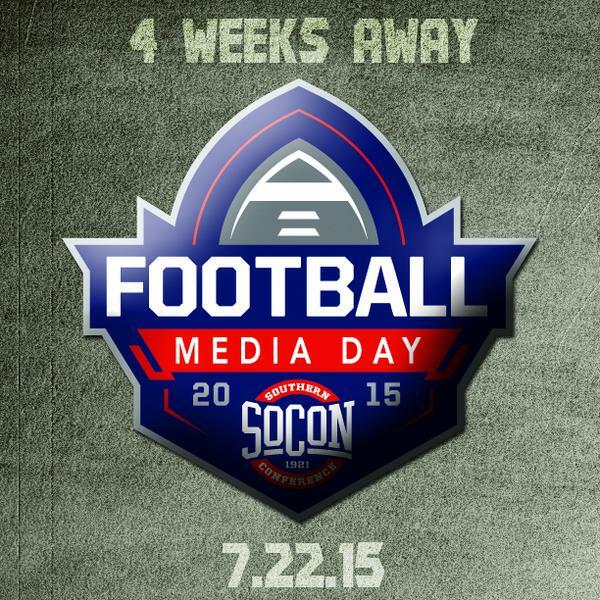 Whitmire Stadium on September 5th in Cullowhee. Prior to Western Carolina: Played along the offensive and defensive line, as well as tight end during his high school career ... Also played basketball and participated in track & field in the weight events including shot put and discus ... High school coach was David Maness. Personal: Full name is Nicolas Chase Stehling ... Is the son of Albert Stehling. Something that is near and dear to the Catamount Nation.... so join in to the 2015 ALS Ice Bucket Challenge this summer !!!! It's now 70 days until kickoff of Catamount football against the Mars Hill University Lions in E.J. Whitmire Stadium on September 5th in Cullowhee. 2014 (Redshirt Sophomore): Played in 11 of the team’s 12 games, twice starting along the defensive line against both Chattanooga and Samford … Recorded five tackles with three solo stops and half a tackle for loss … Recorded a career-high two tackles against Chattanooga (Nov. 1) … Named to the 2014-15 Southern Conference Honor Roll … Playing for the Gold squad, recorded two tackles in WCU’s annual Spring Game. 2013 (Redshirt Freshman): Saw action in 11 of Western Carolina's 12 seasonal games as a reserve on the defensive line and on special teams ... Made his collegiate debut in the season-opener at Middle Tennessee State, tallying a tackle assist ... Credited with two tackles on the year including a solo stop at Samford ... Missed WCU's annual Spring Game due to illness. Prior to Western Carolina: Was a three-year All-Central Carolina Conference selection ... Earned All-County and was tabbed the offensive player of the year runner-up as a senior ... Named to the East-West All-Star game ... Also threw the shot put in track & field as a prep, earning all-conference in the event as a sophomore and junior. Personal: Full name is Avery Dylan Sluder ... Is the son of Darrell and Christy Sluder ... Has one younger sibling, Drake ... Was born in Buffalo, N.Y. It's now 71 days until kickoff of Catamount football against the Mars Hill University Lions in E.J. Whitmire Stadium on September 5th in Cullowhee. 2014 (Junior): Did not participate in football activities, rejoining the team for spring drills. 2013 (Sophomore): Started four of the 12 games in which he saw action, opening the season with three-straight starts at offensive left guard ... Also saw time on placekicking special teams ... Helped WCU had four, 100-yard rushing performances on the season... Credited with one assisted tackle on the season. 2012 (Freshman): Played in nine games along the offensive line and special teams making two starts at right tackle ... Made his first collegiate start against nationally-ranked Appalachian State, also starting at Alabama. Prior to Western Carolina: Three-year letter winner and two-year starter at Millbrook High where he played both offensive and defensive line ... Earned All-CAP-8 conference accolades as a senior ... Was additionally named to the All-OT Football second team offense as selected and released on HighSchoolOT.com ... Listed as a Top 100 player at the ScoutingCarolina.com and made the All-Combine team at the Charlotte Nike SPARQ combine ... Also played basketball as a prep. Personal: Full name is Matthew Allen James DeGraffinreed ... Is the son of Paul M. and Carmelitta M. DeGraffinreed ... Has an older sister, Hannah, who plays basketball at USC-Aiken ... He had two uncles play collegiate football - one at Miami (Ohio) and another at Ashland College, while one of his cousins played at Wittenberg College. Ok all you new Catamounts, you'll hear this a lot the next four years !!!!!!!! It's now 72 days until kickoff of Catamount football against the Mars Hill University Lions in E.J. Whitmire Stadium on September 5th in Cullowhee. 2014 (Freshman): Played in 11 of the team’s 12 games as a reserve along the offensive line and on special teams … Did not see playing time at Samford (Nov. 8). Prior to Western Carolina: Earned first team all-region offensive line for 8-AAAAA in Georgia as a senior ... Listed as a two-star prospect by Rivals.com ... A part of Flowery Branch High's Region 8-AAAAA title in 2012 ... Helped the Falcons average 33 points per game in 2012 ... Was a high school teammate with fellow WCU signee, Jackson McDonald ... High school coach was Chris Griffin. Personal: Is the son of Chris Miles. Head Basketball Coach Larry Hunter announced the addition of Willie Freeman to his staff. "I am pleased and excited to have Willie re-join our program as a full time assistant coach," Head Coach Larry Hunter said. "We have seen firsthand Willie’s work ethic and passion for coaching and recruiting. He has the experience of being our Director of Basketball Operations for over a year, as well as working full time with our women’s program. In addition, he has been a head coach at both the high school and professional IBL levels. Our players will soon learn that he will care about their development both on and off the court as well as bring great enthusiasm in trying to help them improve to be the best they can become. He has a working knowledge of our recruiting and scouting software which will help make his transition back to our program a smooth one." "It’s a blessing to be back at my alma mater and having the opportunity to work and learn from coach Hunter and his staff," Freeman said. "I was thankful for the opportunity to coach on the Western Carolina women’s staff last season but my ultimate goals and dreams were to be a coach on the men’s side." Taking a look at the SoCon football's strength of schedule (SOS) hinges on each team's out of conference (OOC) games. Since 2015 is restricted to an eleven game schedule, each Southern Conference team can schedule up to four (4) OOC games, given that each team will play a seven (7) game conference schedule. We've ranked what we feel is the SOS for each SoCon team, as well as, projected their overall win/loss record for 2015. It's now 73 days until kickoff of Catamount football against the Mars Hill University Lions in E.J. Whitmire Stadium on September 5th in Cullowhee. 2014 (Redshirt Freshman): Played in two games along the offensive line ... Made his collegiate debut in the home-opener against Brevard (Sept. 6), also seeing playing time in the first-place battle with Chattanooga (Nov. 1). 2013 (Freshman): Redshirted ... Named to the 2013-14 Southern Conference Honor Roll. Prior to Western Carolina: Played along the offensive and defensive line at Cleveland HS for head coach Marc Morris, leading the Rams to an 11-win season and the eastern 3-AA regional championship game in 2012 ... As a senior, earned All-Eastern Carolina Conference (ECC) honors ... Recorded 69 tackles including 29 tackles for loss, five sacks, recovered three fumbles while forcing two and had an interception ... In November of 2012, was named the Student-Athlete of the Week by the Raleigh Sports Club ... As a junior, earned ECC Defensive Player of the Year accolades. Personal: Full name is Austin Taylor Jacobs ... Is the son of John and Amy Jacobs ... Has two brothers, Zach and Ben. It's now 74 days until kickoff of Catamount football against the Mars Hill University Lions in E.J. Whitmire Stadium on September 5th in Cullowhee. 2014 (Junior): Played in all 12 games along the offensive line making 10 starts including five-straight to both start and to end the season at left tackle … Was credited with one tackle in the home win over The Citadel (Oct. 25). 2013 (Sophomore): Played in 11 of the team's 12 games including six starts, each coming among the first seven games of the regular season ... Missed the second game of the year at Virginia Tech ... Also saw time on special teams. 2012 (Freshman): Saw action in 10 of the team's 11 games along the offensive line and special teams unit ... Played in every game except at Marshall. Prior to Western Carolina: Helped Boiling Springs High to 32 wins over a four-year career along the offensive line ... Was an all-conference, all-county and all-region selection as a senior, grading out at 92.1-percent with 69 pancake blocks - he was the only player in the Upstate of South Carolina to grade out over 90-percent ... Selected as the Most Valuable Offensive Player as a senior ... Only gave up four sacks in his entire prep career ... Named to the Spartanburg Herald-Journal All-Academic team. Personal: Full name is Hunter Tredway Kirby ... Is the son of Trey and Denise Kirby ... Has three brothers ... His father played collegiate football at Newberry College in South Carolina. Head Coach Mark Speir joined Vince Ferrara and John Adams to preview the Western Carolina Catamounts football season and the game against the Tennessee Volunteers. Jeremiah Tate, a member of the Wofford men's basketball team, drown early Monday morning. Tate was a junior at Wofford College and a member of the men's basketball team for the last two seasons. Tate was a camp counselor at YMCA Camp Thunderbird, and according to media reports he and another counselor jumped from the Buster Boyd Bridge at Lake Wylie in York County. Fire and rescue crews were called shortly after the incident when Tate did not return to the surface. Jeremiah is the son of Frank and Carole Tate of Columbia. Our deepest sympathy goes out to the the Tate family in this tragic loss. "The entire Wofford College family is devastated and saddened today by the loss of Jeremiah Tate," said Wofford Director of Athletics Richard Johnson. "Jeremiah was such a dedicated, loved and respected member of the men's basketball team. He had a wonderful personality and had many friends on campus extending outside of the athletic department. Our thoughts, prayers and deepest condolences are with his family. He will truly be missed." It's now 75 days until kickoff of Catamount football against the Mars Hill University Lions in E.J. Whitmire Stadium on September 5th in Cullowhee. Hometown: East Flat Rock, N.C.
2014 (Freshman): Enrolled in the spring semester at Western Carolina and went through spring drills. Prior to Western Carolina: Was named the Western North Carolina Athletic Conference lineman of the year ... Named to the Asheville Citizen-Times All-WNC team ... Graded out at 90-percent with 46 pancake blocks for East Henderson ... Selected to represent North Carolina in the Shrine Bowl ... Also played along the defensive front, finishing with 67 tackles including 29 solo stops ... Listed as a two-star prospect by Rivals.com. Personal: Is the son of Lee and Jeannine Dalton. It's now 76 days until kickoff of Catamount football against the Mars Hill University Lions in E.J. Whitmire Stadium on September 5th in Cullowhee. 2013 (Sophomore): Started all 12 games along the offensive line for the Catamounts ... Each one of his starts came at offensive right tackle ... Credited with two solo tackles. 2012 (Freshman): Started all 10 games in which he saw action along the offensive line, missing the Furman game due to a right shoulder injury ... His first seven career starts came at right offensive tackle with the final three of his rookie season coming at left tackle. Prior to Western Carolina: Named the 2011 Mountain Valley Athletic Conference Defensive Player of the Year after recording 75 tackles including 19 for loss and six sacks ... Added four pass break-ups, forced two fumbles and blocked three kicks ... Was named All-MVAC on both sides of the football as a senior, leading Ashe County High to the school's ninth-consecutive state playoff berth ... Earned All-Northwestern Region accolades on offensive and defensive line - the only player to do so in the region ... Led the region in sacks ... Was a three-time all-conference selection, amassing over 279 career tackles ... Was a two-sport athlete at Ashe County High, adding an individual conference championship in wrestling ... Was a two-time state qualifier, placing one season ... Was twice named all-conference as a wrestler ... Won the 2-A state champion in wrestling (285 lbs. weight class) as a senior ... His overall record for his senior year was 44-1 including a 40-match win streak, and his overall record was 136-18. Personal: Full name is Joshua Dale Wineberg ... Is the son of Dale and Amanda Wineberg ... Has an older sister, Jessica Smith. Spend a little time with Western Carolina's own Matt Stillwell this Father's Day as he sings "Hey Dad"
It's now 77 days until kickoff of Catamount football against the Mars Hill University Lions in E.J. Whitmire Stadium on September 5th in Cullowhee. Personal: Is the son of Doyle and Kim McLaughlin. It's now 78 days until kickoff of Catamount football against the Mars Hill University Lions in E.J. Whitmire Stadium on September 5th in Cullowhee. Prior to Western Carolina: Was a four-year letter winner between both West Charlotte Senior High and North Mecklenburg High Schools ... Earned All-I-Meck 4-A Conference accolades and first team All-Region plaudits as a senior. Personal: Full name is Sheldon Xavier Kinard ... Is the son of Yatu Davis and Kannetha Kinard. Catamount athletics is providing a special tailgate / ticket package for the battle on Rocky Top that includes game tickets, pregame barbecue buffet provided by Calhoun's BBQ on the River and beverages. A special Purple Zone pregame tailgate presented by Phillips and Jordan Construction and the Cullowhee River Club will be hosted by WCU Alumni Association and the Catamount Club prior to kickoff at the Humanities Plaza / Tennessee Park on UT's campus. The cost of the tailgate and ticket package is $60 for adults (13 & older), $50 for youth (6-12) and $40 for children age five and younger which includes free admission to the tailgate. The tailgate only package is $25 for adults, $15 for youth and free for children age five-and-under. Tickets, priced at $40 for all ages, must be purchased through WCU Ticket Office by Friday, August 21 to guarantee tickets in hand and seats in the WCU section. For more information or to purchase tickets and the tailgate package, contact the WCU Athletics Ticket Office toll free at (800) 34-GOWCU or (828) 227-2401, or via Email at tickets@email.wcu.edu. It's now 79 days until kickoff of Catamount football against the Mars Hill University Lions in E.J. Whitmire Stadium on September 5th in Cullowhee. 2013 (Redshirt Sophomore): Played in 11 of the team's 12 games on the year, making three starts along the defensive line ... Made his first collegiate start in his college debut in the season opener at Middle Tennessee State ... Credited with eight tackles including a solo stop and 1.5 tackles for six yards of losses ... Twice recorded half a sack totaling six yards in losses, recording half a sack against Mars Hill and at Chattanooga ... Made his first tackle at ACC-foe, Virginia Tech, finishing with two stops ... Picked up his first career solo tackle as a part of a career-best three hits at Chattanooga ... Broke up a pass attempt in the home win over Elon.2013 (Redshirt Sophomore): Played in 11 of the team's 12 games on the year, making three starts along the defensive line ... Made his first collegiate start in his college debut in the season opener at Middle Tennessee State ... Credited with eight tackles including a solo stop and 1.5 tackles for six yards of losses ... Twice recorded half a sack totaling six yards in losses, recording half a sack against Mars Hill and at Chattanooga ... Made his first tackle at ACC-foe, Virginia Tech, finishing with two stops ... Picked up his first career solo tackle as a part of a career-best three hits at Chattanooga ... Broke up a pass attempt in the home win over Elon.2013 (Redshirt Sophomore): Played in 11 of the team's 12 games on the year, making three starts along the defensive line ... Made his first collegiate start in his college debut in the season opener at Middle Tennessee State ... Credited with eight tackles including a solo stop and 1.5 tackles for six yards of losses ... Twice recorded half a sack totaling six yards in losses, recording half a sack against Mars Hill and at Chattanooga ... Made his first tackle at ACC-foe, Virginia Tech, finishing with two stops ... Picked up his first career solo tackle as a part of a career-best three hits at Chattanooga ... Broke up a pass attempt in the home win over Elon. 2012 (Redshirt Freshman): Did not see game action. 2011 (Freshman): Redshirted ... Came to the United States in January of 2011 and attended Western Carolina University but did not participate in football activities, joining the squad during the summer months ... Named the offensive scout team player of the week following the Chattanooga game. Prior to Western Carolina: Played rugby where he was a part of the provincial championship team in consecutive years ... Won the national rugby 7's championship ... Attended Saint Mary's School in Nairobi. Personal: Full name is Helva Kayembe Matungulu ... Is the son of Kande and Bilonda Matungulu ... Speaks three languages - English, French and Swahili. It's now 80 days until kickoff of Catamount football against the Mars Hill University Lions in E.J. Whitmire Stadium on September 5th in Cullowhee. 2013 (Redshirt Freshman): Saw action in seven games on the season, each as a reserve at wide receiver and on special teams ... Did not record a reception on offense, but was credited with three tackles including two solo stops ... Named to the 2013-14 Southern Conference Honor Roll ... Tallied a reception for the Gold Squad in WCU's annual Spring Game.